Still, lack of draw was apparent and with Dark Prophecies they filled that hole in strategy with Antimatter. If you compare it to other draw engines in game at that time it was most expensive one. Gain of one card for 3c is really expensive, and only synergy with discards had Soul Reaper and some gimmicky stuff like discarding attachments for Xar Modulator. Cost of discarding a card was real cost back then and that was the reason many deck builders were reluctant to rely on it and still went on burst draw route. Now with Shattered Fates with new discard mechanic and few other tools the downfall of using Antimatter has been greatly mitigated to the point it really isn’t a cost any more. Discarding Brimstone Devourer can be looked at like 3cc: draw a card and deal 3 damage. Discarding Reactoary can be looked at like 3cc: draw a card and play 3/2 vanilla ally. Discarding any card with Dagger of Fate in play can be looked at like 3cc: draw a card and deal 3 damage. Discarding any ally can be looked at like 3cc: draw a card and heal 2 damage later on with Soul Reaper. Basically only dead draw Elementals now have with antimatter is getting two non ally cards without Dagger of Fate in play. 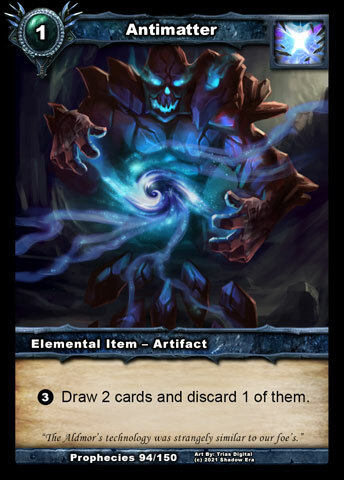 Considering that Elementals can make use of many draws from Antimatter you can now look at it like they are always having +1 card in their hand, where that +1 comes as discard effect of one of top 2 cards in deck. And if they use Meat Wagon for example, they can even see that card! As you can see in two expansion Elementals (well Zaladar mostly, some argue that Antimatter feels weird in Elementalis deck) have come from class with non existent draw engine, to class with very clumsy and tempo consuming draw engine, and finally in SF to class with one of most tempo boosting draw engines. Antimatter – from meh to awesome. Tagged antimatter, card, elemental, Shadow era. Whoever designed that card deserves some high praise!